You Think You Know Me is a conversational card game that inspires players to learn more about one another in a real life setting. Game creator Ami Baio explained that the cards help people open up in a safe, trusted way with questions and open statements. 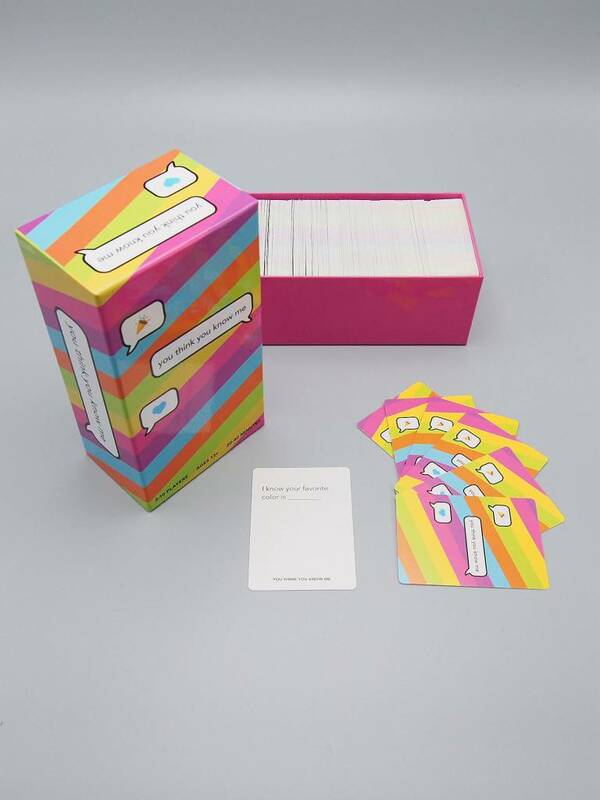 You Think You Know Me is a conversational card game for 2-10 players that playfully tests how well you know your friends, family, partners, or coworkers — helping you learn more about what they love and who they are. …Each player is dealt a hand of seven cards, and play starts with the person whose birthday is closest. Players take turns choosing a card from their hand, and picking any other player to read it to, guessing how they would answer. If they guessed correctly, they discard the card. If they were wrong, they discard and draw a new card.